Coffee and a Book Chick: Monday, Monday! It's Monday! What Are You Reading? Hosted by Book Journey. It’s Monday! 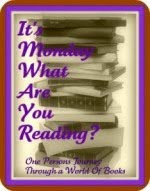 What Are You Reading, is where we gather to share what we have read this past week and what we plan to read this week. It is a great way to network with other bloggers, see some wonderful blogs, and put new titles on your reading list. Mailbox Monday! Created by The Printed Page and hosted in August by Chick Loves Lit. "Mailbox Monday is the gathering place for readers to share the books that came into their house last week. Warning: Mailbox Monday can lead to envy, toppling TBR piles and humongous wish lists. If you’re new to Mailbox Monday welcome! Thank you to everyone who stops by Mailbox Monday. Whether you comment or visit I appreciate your taking the time to drop in." So, here we go -- I am currently reading (and IN LOVE with) The House of Mirth by Edith Wharton. I saw the film with Gillian Anderson years ago and absolutely loved it, and I finally got around to reading the novel. Starting a classic can always feel a bit intimidating, but this is one to surely start as it's a short book at about 340 pages, and it is absolutely thrilling to get a snapshot into New York society at the turn of the century. It's filled with drama, gossip, love, betrayal, lies, and complete and total confusion. Love this book!! Mailbox Monday-ooh, I have some good ones! Paperbackswap arrived with some really exciting books I've wanted to read, sent by a new friend in Massachusetts. I received Anita Shreve's Sea Glass , Jasper Fforde's The Eyre Affair , & Alice Hoffman's Skylight Confessions ! Alayne over at The Crowded Leaf sent me the book that I won in her giveaway, The Palace of Strange Girls . Read The Crowded Leaf's review here! Oh, my! What a good collection of books to start my week off! I'll also be on business travel this week to Dallas, so I'm sure my suitcase will have a tad more weight to it than usual! Posted at 6:36 PM // Labels: Mailbox Monday, The House of Mirth, What are you reading? I went through an Anita Shreve period years ago, and this was the first. The cover of mine was just beautiful. I remember liking it, but I don't remember much else. Also liked the Jasper Fforde. I need to get back into that series. Enjoy! What a nice variety of books. I like Anita Shreve a lot. Sea Glass was good, but my favorite, by her was Strange Fits of Passion. Enjoy them all. Love the Jasper Fforde series. I read the most recent one this week. If you haven't read them before you are in for a treat. Since I didn't know the details of plot of Jane Eyre when I read The Eyre Affair it had even more suspense for me! @ Picky Girl -- I've only read Testimony by Anita Shreve and really enjoyed it. I've meant to pick up The Pilot's Wife forever, but never got a chance to, so I might end up jumping into that after Sea Glass. And I'm excited by the Jasper Fforde series, too! @ Bibliophile by the Sea -- I'm definitely going to have to check out Strange Fits of Passion, I'm interested in the title! @ Heather -- I haven't read this series yet, so am really excited! I've heard such good things about it! @ Peppermint Ph.D. -- Oh, my, I didn't realize how much I would love Edith Wharton! I literally have fallen into the world she's created. I love this glimpse into the "high" society at the turn of the century! It's so finny because I have all the books that are in your pile except the Alice Hoffman book, but I have other of her novels to read. talk about having similar taste! Enjoy Edith Wharton. I have yet to read anything by her or see any of the movies. It's on my list for one of these days. Nice choice of books. I use to read Anita Shreve all the time. Only recently did I pick up her book Testimony, which I loved. I stopped reading her novels. Love your blog and hope to become a frequent visitor. Great books and just in time to take on a trip! Enjoy! Oh I remember the House of Mirth being my favorite Wharton way back in the day! I'm sure there was even a paper written on it. But it's been so long, revisiting it sounds like a fab idea! I haven't read anything of Edith Wharton's and have been thinking of making her my Sept classic read. I think you've just helped make up my mind. Wow-great books to choose from-hope it's a long flight. Thanks for stopping by and saying hi! I've only read one book by Edith Wharton and really want to read more by her. Enjoy your book and the other new ones you got! If you happen to have some free time in Dallas (and are somewhere in the area) go check out the Half Price Books on Northwest Highway. It's huge! I lived in Dallas forever and that's one of the places I miss most. 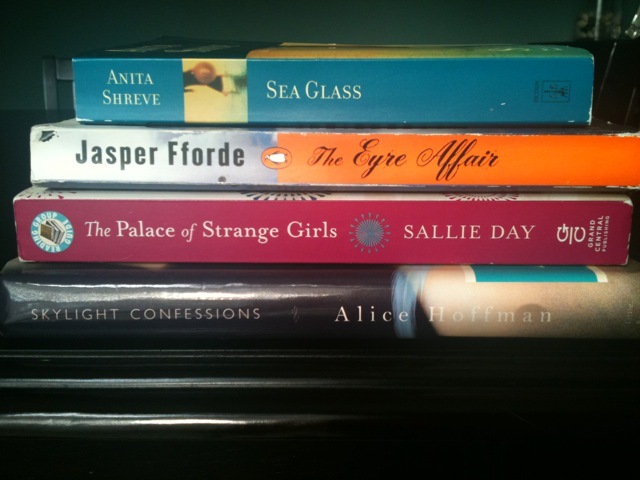 Oh, you have some great books there...from Anita Shreve to Alice Hoffman. Enjoy!! I've always wanted to read The House of Mirth but wasn't sure if I could get into it. I'm pretty picky about my classics. I look forward to your review! @ Nicole (Linus' Blanket) -- I just wrote up my thoughts on The House of Mirth, and LOVED IT!! I highly recommend! @ Carolina Book Stacks -- I love reading Testimony, that was the only book of Shreve's I've read thus far. Can't wait to try another one! @ Beth (bookaholicmom) -- You are absolutely right, and I did have options for my trip! @ Sheila (Bookjourney) -- The House of Mirth was incredible, and I have just downloaded more Wharton novels onto my iPhone. Weird to be reading something like that on a handheld device, and it'll be my first time, so I'll see how it goes! @ Heather -- Do pick it up again!! @ Cat -- Let me know what you think when you read it! @ Joann - Thanks for stopping by! I'll hop by over to your site! @ Samantha -- I would love to hear your thoughts once you read it! @ Bookventures -- I'm really excited to read Fforde, I've never read any! @ Laurel-Rain Snow -- Thanks for stopping by! I'll hop to your site! Still to read an Anita Shreve as well - think I want to start with Testimony though, but am looking forward to your thoughts on Sea Glass. @ Booklover Book Reviews -- I can't wait to read Sea Glass; and maybe we should read The Eyre Affair at the same time! @ anothercookiecrumbles -- Hmm, thinking a fun little read-along for The Eyre Affair might be fun...! @ Elizabeth -- Many thanks! !